Melissa Etheridge called it her favorite casino and she even learned how to say Salamanca (a little running joke from her last appearance at the venue in 2011) as she addressed the crowd during her matinee show at the Seneca Allegany Events Center Sunday afternoon. This time around it was Etheridge by herself sans-band, dubbed the “This is ME Solo” Tour. 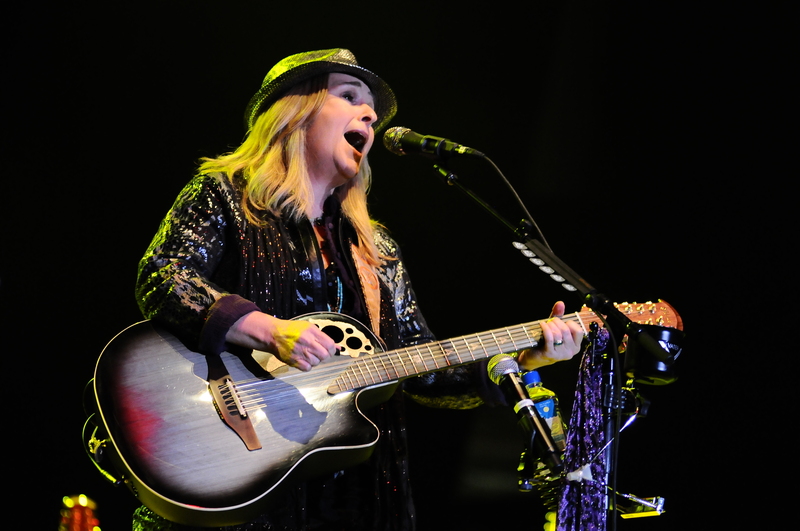 Etheridge came out wearing a hat as she tore into “Bring Me Some Water”, the first song that garnered her some attention (a Grammy nomination) from her debut self-titled album. “Yes I Am” was next but just before she was about to play her third song she noticed a fan’s sign. It was no ordinary sign as it had built in lights and there was a lot of writing on it. The fan wanted to hear Etheridge play “Silent Legacy” as it appears it was on the fan’s bucket list. Etheridge obliged as she encouraged fans to yell out song titles and such as she jokingly said she probably wouldn’t understand them. For the most part Etheridge played guitar (both electric and acoustic), although she tickled the ivories on “The Letting Go” and the Joan Armatrading cover “The Weakness In Me”. She also had a tambourine and a hand held drum which she used to start off a few songs using a looping beat technology. For the diehards there were a few deeper cuts like the aforementioned “The Letting Go” and the very seldom played “Occasionally” from her debut. Etheridge is one of many artists involved in social media and it appears “Occasionally” may have been played due to a request posted to her on her Twitter account. We were also treated with “Take My Number” a new delicacy which will be on her forthcoming release called This Is ME sometime in the fall. She went on to play some of her biggest hits as the show rode on. “Come To My Window”, “I Want To Come Over” and “I’m The Only One” which left the fans begging for more as she exited the stage. Returning to the stage Etheridge saved “Like The Way I Do” for last. It was an extended version which gave a good synopsis and overview to anyone who may be seeing her for the first time. In my final analysis, this was perhaps the best show I’ve seen from Etheridge. It made for a good introduction about who she is, who she was and gave us a glimpse into her future. The show was a celebration of her career at that particular moment. In an age where music is more about image than the songs, it’s good to see there is someone who still writes pertinent music.